When exploring an information space, it’s important for a group to know where they are at any given time. What have we covered, and what did we leave behind? By using SQUID, a group charts out the territory as they go and can navigate accordingly. 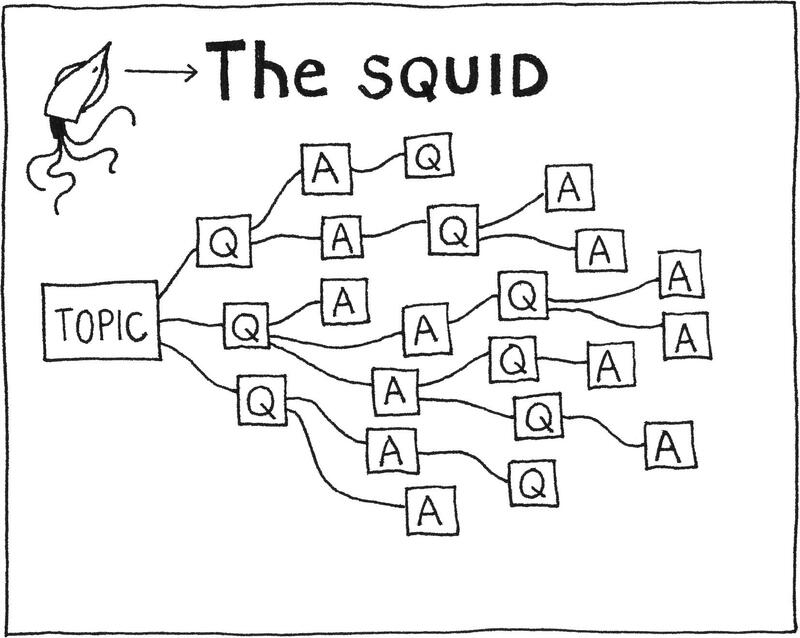 SQUID stands for Sequential Question and Insight Diagram. It is created progressively over the course of a meeting with sticky notes, capturing questions and answers as the group moves through the space. It is flexible and will move and grow with the discussion, but it also needs to “breathe” by moving between its critical modes of questions and answers. 1. 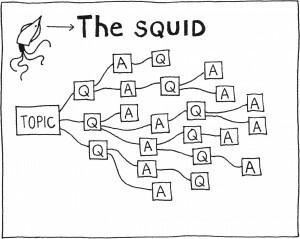 Reserve a large area of a whiteboard or several flip charts to create the SQUID. Participants are given two colors of sticky notes to work with, one for questions and one for answers. 2. Start to build the diagram by writing the group’s core topic on a sticky note. Put this in the center of the space. Question mode: To open the exercise, ask individuals to generate a question that is their “best guess” on how to approach the topic. They capture this on a color-coded sticky note, and share it with the group by posting it adjacent to the center of the SQUID. The questions should immediately offer a few different routes of inquiry, and participants will likely start offering thoughts on answers. Answer mode: Similar to question mode, participants write their “best answers” on color-coded sticky notes. They share them with the group by posting these notes adjacent to the relevant question and connect them with a line. They may answer more than one question, and they may answer one question with multiple answers. As a rule, answers should be succinct enough to fit on one note. After a discussion, the group then moves back into question mode, generating questions based on the last round of answers. Participants may focus on earlier parts of the SQUID as well. The process repeats over the course of the discussion. Keeping with the current mode and not crossing questions with answers requires discipline that can only be acquired by a group through time. By working in this way, a group will train itself on the value of a systematic, rhythmic movement through unknown information, in contrast with a meandering group discussion. The SQUID itself is, of course, utterly flexible and will grow as the group directs it. The SQUID game is credited to James Macanufo.